Celebrate back to school with a field trip! We can bring a field trip to you, or you can join us on a field trip near Santa Barbara and Ventura, just an hour from Los Angeles. Hands-on field trips are a great way for kids to learn and grow with one another as the school year progresses. 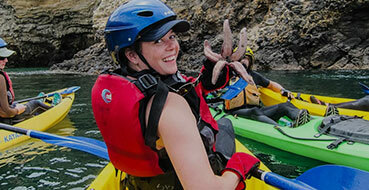 Santa Barbara Adventure Company has been running group trips and outdoor education for over 20 years. All of our trips have a large learning component, we love the outdoor classroom! Field trips can be customized to meet Common Core standards, CA standards, or any curriculum. Trip options are completely customizable to fit your needs, let us help you take care of the details. what they’ll learn: The real question is what WON’T they learn? The Channel Islands are home to some of the richest biodiversity on earth. Guides will give interpretation regarding the Santa Barbara Channel, one of the most biodiverse and productive ocean systems in the world, as well as the national marine sanctuary in our backyard. Students will have a chance to get a close-up look at marine invertebrates and other sea dwellers. Santa Barbara’s Refugio State Beach is a great spot for a short paddle, and super fun beach day. Located on rural and undeveloped coastline, this is a beautiful area rich with marine life. This activity will give the students the opportunity to learn first hand about kelp beds, the coastline, marine environment and California’s State Park system. We often see dolphins, sea lions and other marine life while on the water. This is also one of the closest state beaches outside of the Malibu/L.A. area — and it’s a beautiful one! what they’ll learn: Kelp Forests are one of the most productive and dynamic ecosystems on the Earth! What better way to learn about this biome than to see it first hand? The Gaviota Coast provides an excellent backdrop to discuss marine life. Guides will also discuss California’s natural and human history. Through various individual and group challenges, students will build confidence in themselves and others and learn skills that will translate well into many life experiences, teambuilding and challenge skills. This is great for problem-solving and stepping outside of their comfort zone. Everything is challenge-by-choice. This is also one of the closest ropes course options to L.A. and Santa Barbara. what they’ll learn: High Ropes Course consists of a series of group initiatives focusing on the development of communication methods, trust and problem solving techniques. Through active experimentation, reflection, and application of skills, participants explore the complex and transformative meanings of trust, cooperation, and thinking outside the box, all of which culminate into a unique bonding experience. Throughout this challenge-by-choice program, skilled facilitators guide discussions that directly address parallels to school, work and life. The most epic of them all – sea cave kayaking at Santa Cruz Island in Channel Islands National Park is a full day adventure full of fun challenges. what they’ll learn: They’ll be able to challenge themselves by going in and out of sea caves, exploring the marine sanctuary, playing kayak games and more. The sea caves have been created over 1000s of years and guides explain how the islands came to be the way they are today. See the endemic island fox, marine mammals and more. Release their inner Californian! Our certified instructors are great with kids, and most people “get up” within their first hour of learning. Instructors focus on providing students with the fundamentals: reading the water, paddling, and standing up. Combine this with lunch and other beach activities and it’s the best field trip activity. what they’ll learn: A new sport that they can enjoy for a lifetime. We provide all the gear and instruction, students just have to come ready to learn and have fun. What are some of your favorite field trips or games to play on a field trip? Let us know in the comments!